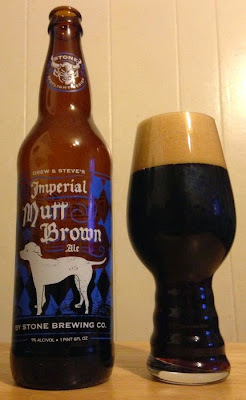 Stone's new American strong ale is called Drew & Steve's Imperial Mutt Brown Ale. It may be named for a dog, but it kicks like a mule. This beer pours a light, milk chocolate brown with an average had that doesn't leave much lace. There's warm caramel and spice in the aroma, some apples, some cinnamon. The flavor is sweet and rich. The malt is as big and warm as a bakery. Brown sugar, almonds, a little bit of chocolate. The ABV is well hidden in all that bready sweetness, and it snuck up on me and punched me in the back of the head.